One of my pious intentions for the year 2010 is to start writing some application for the Mac. Apart from the hype about iPhone development, I think that starting out in that area is especially appealing, as it reduces the size of the API one has to learn. Getting to know the iOS libraries is a lot easier than handling the endless amount of Cocoa frameworks. One thing that I discovered recently is the support of blocks, that has been introduced with OSX 10.6 and iOS 4.0. The problem was, that XCode set my execution environment to OSX 10.5 which does not have support for blocks. To fix this, one has to update the MACOSX_DEPLOYMENT_TARGET build variable. Right Clicking on the XCode project in the “Groups & Files” view will bring up a context menu with “Get Info” (or pressing CMD+I while project is selected). 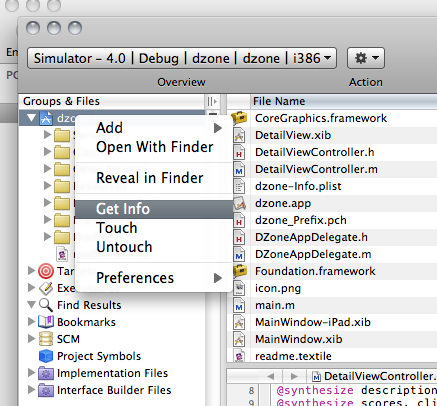 The info pane has a “General” tab that lets you select the “Base SDK for All Configurations”, which I set that to iOS 4.0. 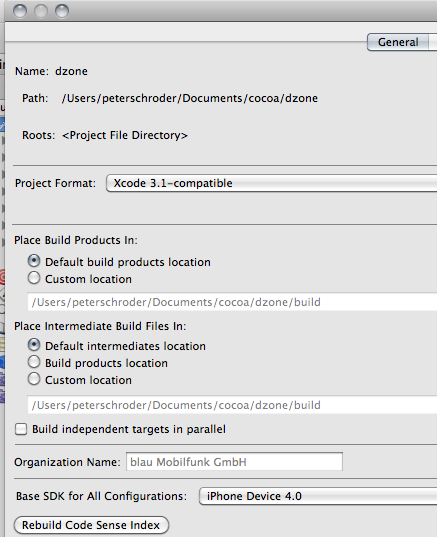 An other option is to search for “MACOSX_DEPLOYMENT_TARGET” in the “Build” tab and changing that value accordingly. Make sure “Show” is set to “All Settings”. At least some Objective-C sugar!